The unexpected discovery, described in the journal Science Advances, astonished scientists who weren't setting out to study female artists in the Middle Ages. It adds to a growing recognition that women, and not just monks, labored as the anonymous scribes who painstakingly copied manuscripts and decorated the pages to dazzle the eye. This particular woman lived in a small religious community at Dalheim, Germany. Little is known about life there, says Christina Warinner of the Max Planck Institute for the Science of Human History in Germany. "Basically all that remains are the stone foundations. A broken comb was found, but almost nothing else," Warinner says. "There are no books that survived. There's no art that survives. It's known only from a handful of scraps of text that mention it in passing." She and a colleague were examining the teeth of skeletons from this community's cemetery to see what had been preserved in the dental calculus, or tartar. Tartar forms from sticky plaque that traps remnants of food, bacteria and even pollen and then hardens over time. "It's really an extraordinary material," Warinner says. "It's actually the only part of your body that fossilizes while you're still alive." Her colleague Anita Radini, of the University of York in the United Kingdom, spotted something bright blue in the dental sample from this woman. "It was absolutely unbelievable. It almost looked like there were robins' eggs on the microscope slide — they were such vibrant blue particles," Warinner recalls. "I remember joking around at the time that maybe we discovered an artist painting with lapis lazuli." The idea seemed absurd. 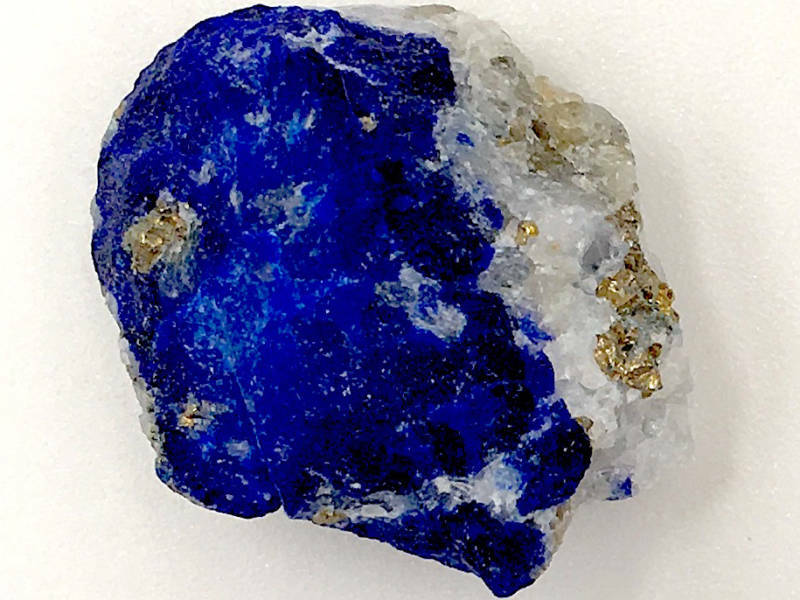 After all, lapis lazuli was one of the most expensive pigments known in the Middle Ages. At the time, it came from just one source — a region of Afghanistan — and was used only by artists of exceptional skill. "It was rare," Warinner says. "It's really iconic. It's kind of the blue that we associate with the Middles Ages that's absent in Roman art." The researchers turned to technologies that could analyze the elemental composition of the microscopic particles as well as the mineral structure. "And ultimately we did find that it was indeed lapis lazuli, which was really, really surprising," Warinner says. "Once it all came together that this was lapis lazuli, and this was a woman, and she was in this kind of small, remote place, really far away from where this lapis lazuli would have come from or been traded from, it was pretty extraordinary." Warinner reached out to Alison Beach, a professor of medieval history at Ohio State University in Columbus. "I realized this is a really sensational find," Beach says. "There's quite a bit of evidence of female contributions to book production. And it's gotten more attention in the past 20 years," Beach says. "But I still think that image of the monk as the producer of books is very central and very resilient." Of those books that were signed with the name of the scribe before the 12th century, less than 1 percent can be attributed to women, the researchers write in their report. But Beach says it's just impossible to know how widespread women's participation was, because many libraries of medieval books have been lost to history. What's more, most of the surviving books from this period were produced by scribes who did not sign their work. "I'm still trying to convince colleagues that they should immediately consider female book production or ownership or use when they encounter an anonymous manuscript in the Middles Ages," Beach says. "Was 'anonymous' a man or a woman? We really just don't know for most of them." The researchers considered various explanations for how the blue pigment ended up in the woman's teeth. One possibility is that she wasn't an artist but rather engaged in devotional kissing of a decorated text. "You'd have to be doing a lot of kissing of a book over a lot of time to get that much lapis lazuli pigment," Beach says. "That one seemed, to me, to be the least plausible." Another possibility was that the woman consumed the pigment as a kind of medicine. That also seems unlikely, given the lack of evidence that this was common in Germany in the 11th and 12th centuries. What's more, the lapis lazuli residue was found more toward the front of the mouth than the back. "I thought they made a nice case that because it is up near the lips, that it was most likely related to the notion of moistening the brush," says Cynthia Cyrus of Vanderbilt University, who has studied medieval scribes associated with women's convents but was not part of the research team. "As you put the tip of the brush into your mouth to bring it to a point, a little bit of the pigment residue then makes its way into the dental structure. That would explain the differential between back of mouth and front of mouth." It is true that simply grinding lapis lazuli can produce fine, airborne dust that ends up on the lips and in the saliva, the researchers found — because Radini tried it herself. However, given the small size of this religious community — only around 15 people — it's likely that this artist produced her own materials rather than making them for sale or for someone else. "You're going to be creating your own pigments and using your pigments," Cyrus says. "This individual may, in fact, have been doing both of those activities." In Cyrus' view, this finding is extraordinary. "It is a brand-new kind of evidence for scribal activity, and one that we haven't been on the alert for," she says. 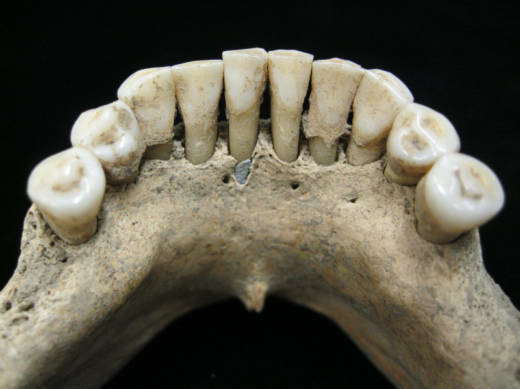 "We now know that evidence from teeth, and other skeletal remains, can really point towards what the daily life of a particular monastery was like. That will lead us to ask different questions when we're doing excavations and combine different kinds of evidence to get a better understanding."